Spray polyurethane foam (SPF) offers the most cost-efficient, versatile and effective insulation available. This seamless, self-adhering solution for coolers and freezers maximizes cooling space while minimizing costs. Applied with the proper elastomeric coating, spray foam insulation is food-safe and fully meets USDA and FDA requirements. DFW Urethane offers decades of experience insulating coolers and freezers with spray foam in Dallas, Ft. Worth and across Texas and Oklahoma. Count on the right SPF solution for your building or space. Spray foam insulation is the most prevalent and effective product for food and produce refrigeration, storage and transportation. It creates a seamless air seal that maintains contents at the specific desired temperature. There are no laps, no seams, no leaks. No wonder SPF is used worldwide in refrigerated trucks and railcars, steel tank cars, open-top freezers and ice chests. We can spray the perimeter walls, ceiling, under the floor and all around the inside of specific rooms or your entire building to insulate it. Simply add a refrigeration unit and it serves as your cooler. If your building has partition walls and multiple rooms, sprayed and refrigerated rooms can be operated at different temperatures. 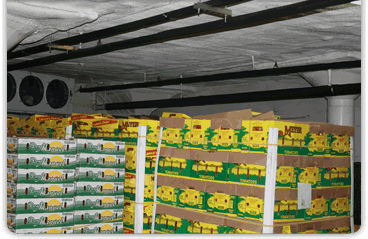 Foam insulation can be sprayed to the bottom of the roof deck, so you can store more product without wasted space. Unlike the rubber gaskets used in pre-manufactured coolers, foam insulation does not leak air over time. Benefit from the highest quality, most energy-efficient insulation for your coolers or freezers. In addition, we will cover the SPF insulation with an approved coating that carries the necessary USDA and FDA ratings. Let DFW Urethane show you how cool foam insulation can be in Dallas, Fort Worth, Austin, San Antonio, Texas and Oklahoma.